KIRYAS JOEL—Cars were backed up as far as the eye could see on the way to a town board meeting at Bais Rachel Banquet Hall in Kiryas Joel on Sept. 8. The Monroe Town Board voted 4-1 approving the annexation by Kiryas Joel of 163.8 acres and disapproving annexation of 507.4 acres. For more than an hour, council members tried to explain their position on the proposals to the crowd as hecklers in the audience shouted at them. The board said that this is not over, and Monroe residents now have a 30 day waiting period during which further negotiations are possible. The options we have available to us today will not exist in 30 days. Prior to the meeting, a steady stream of people walked to the building and were watched by curious adults and children in their yards along the sidewalk. With an estimated crowd of 1500 to 2000 mostly non-residents of Kiryas Joel, the hall was standing room only, and several hundred stood outside the door to listen to the proceedings on a loudspeaker. State police stood by to keep order. The MidHudson News reported the village board on Sept. 6 approved the annexation petitions for both the 507.4 and 163.8 acre petitions and adopted a positive findings statement in response to the final generic environmental impact statement. The issue of infrastructure is critical. The non-resident attendees loudly commented with cheers, chants, and boos statements made by opponents and supporters of the annexation petitions. Town Supervisor Harley Doles stated a key part of the vote to approve was infrastructure. Monroe has not improved its infrastructure in almost 40 years. “The issue of infrastructure is critical,” Doles said. He said the vote reflects the town’s ability to provide necessary infrastructure to 164 acres and not 5o7 acres. Doles said the board has been on its own without county or state support for almost two years. The decision, he said, was based on not giving any particular group rights over anyone else. On several occasions, Doles asked for decorum over the loud responses from the crowd. 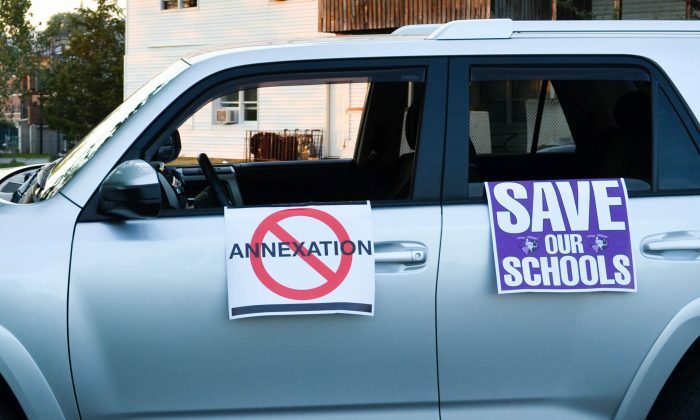 Opposition to the annexation has come from the government of Orange County, residents of Monroe, and residents of Kiryas Joel itself. On Aug. 21 the county issued a 20-page response to the final generic environmental impact statement that, among other issues, argued that the water supply and sewage treatment facilities were not adequate to handle the projected growth in the annexed area. A widely voiced concern among Monroe residents is the fear that their community has lost self-determination. Standing outside with nonresidents of Kiryas Joel was a group of Hasidic men holding banners opposing the annexation who held similar concerns. Some said the process that has been followed goes against their religious beliefs. Rabbi Yoel Loeb said possibly as many as half of the residents of Kiryas Joel opposed the way the annexation petitions were handled by the enclave’s religious leadership. Schlome Katz concurred. “We have to be humble and loyal citizens to our governments wherever we are located. We are not allowed to gain authority to overpower other people.” He said the way this was being done was a violation of their religious laws. Rabbi Yoel Loeb said as many as half of the residents of Kiryas Joel opposed the way the annexation petitions were handled by the enclave’s religious leadership. Monroe resident Erick Tadal, Jr. said he wanted everyone to have equal rights in the process which he thought the board was ignoring. “I don’t mind [the Hasidic community] but I don’t want them to think it’s only a one-way street.” Some longtime Monroe residents said that many Monroe voters declined to vote on the issue years before when this could have been handled better. Leaders of the densely-settled enclave of ultra-Orthodox Satmar Hasidic Jews say the village of 22,000 is bursting at the seams and needs more land to accommodate its quickly growing population. Opponents of the annexation request, which was made by Satmar living out of Kiryas Joel, say they fear increased congestion from more apartment buildings in the suburban area. Opponents are expected to argue in court that the village has failed to follow state environmental law. State Assemblyman James Skoufis, an ardent opponent to any annexation to Kiryas Joel, said the Monroe Town Board “wrongly approved” the petition, reported the MidHudson News. “I strongly believe that a more sustainable approach is needed, one that preserves the intent of annexation law while forging a more considerate relationship with nearby communities,” Skoufis said. The 1.1-square-mile village of Kiryas Joel was founded within the town of Monroe in the mid-1970s by members of the Satmar sect seeking a more tranquil setting than Brooklyn, about 60 miles south. Men wear black suits with brimmed hats and women dress modestly. Marriages come early and families are large, which has helped the population grow quickly.